We had been watching the World Cup soccer game between USA and Ghana in the bar where my son-in-law is a bartender. The added excitement was that members of the Reign soccer team were also in the bar. I enjoyed my tonic water with lime and watching my son-in-law interact with the customers. I am grateful that soccer is easy to understand, easy to watch and the USA won. Tomorrow I am driving from MN to KS with my niece and her 5 small children. Well, it is actually my late husband’s nephew’s wife and children or my sister-in-law’s grandchildren and daughter-in-law. Anyway you say it, it is people who I count as family and love very much. And I am sure driving from MN to KS with a newborn, 2-year-old, 4-year-old, 5-year-old and almost 8-year-old would have never been on my bucket list but it is going to be adventure. You may ask why? My nephew is in the Army/National Guard Reserves and his annual active duty time is in Leavenworth, KS – his hometown. He will be finished on Friday so “we” are all driving to meet him at his folks, my sister-in-law’s house. I am pretty sure the stories from this journey will be bucket list worthy. My first child was born three weeks after her due date and then only by force. My second child would arrive 5 days early. I would actually have labor with my second but she would also be born by C-section. My hubby would be seated next to me and I would watch in the mirror my doctors had set up. She would be totally wrapped in the cord just like baby #1 and the nurse would lay the baby’s cheek on mine and I would be in love. Wristbands would be placed on the baby and me and my hubby would leave the delivery room with the baby to head for the nursery. Within a matter of moments, Bruce, the baby and the nurse would be back. “What’s wrong?” The wrong date had been written on the wristbands it said June 2 but it was after midnight so it was June 3. So my wristband and baby’s wristband had to be changed and they had to be changed in my presence. My daughters are 3 years and 3 days apart. There was no planning in that. It just worked out that way. It made it easy for family birthday parties which were always combined. Even though my children are born the same time of year and are both girls, they are very different. When they were little I would say they were night and day. I think God did that intentionally so I won’t think I had parenthood figured out. My first was a little timid about trying new things. She had to “check things out” before taking part in activities. My second would “jump right in” and then have a look of oops! 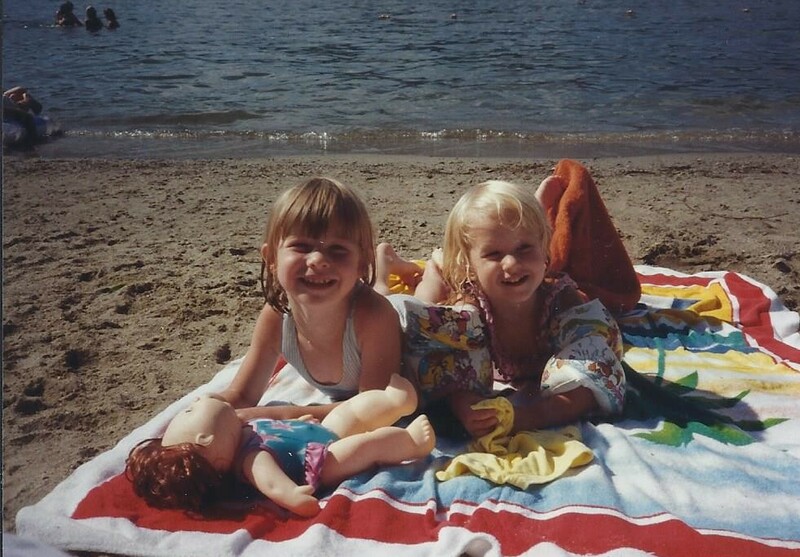 For example, when my girls were little we belonged to the Sterling Forest Beach Club. It was a lovely beach on Greenwood Lake probably less than two miles from my house. There was a sandy beach area that gently sloped down to the water. The area was surrounded by beautiful trees as it was part of Sterling Forest. There was a playground and free swim lessons for the kiddos. I would sit on the beach in my sand chair and Emily, child #1, would play at the water’s edge with her sand toys. Meghan, child #2, was more adventurous. I remember one day in particular when Meghan at age 2 walked into the lake. I was watching her and so was the lifeguard. The lifeguard commented “how far do you think she will go?”. I said “let’s see.” Emily was concerned that the lifeguard and I were allowing Meghan to walk in. We were both standing close enough to grab her but that little stinker walked in up to her chin. Unbelievable!! That little stinker turns 27 today. Where do the years go! Happy Birthday, Meghan! I am blessed to be your mom and so very proud of you.